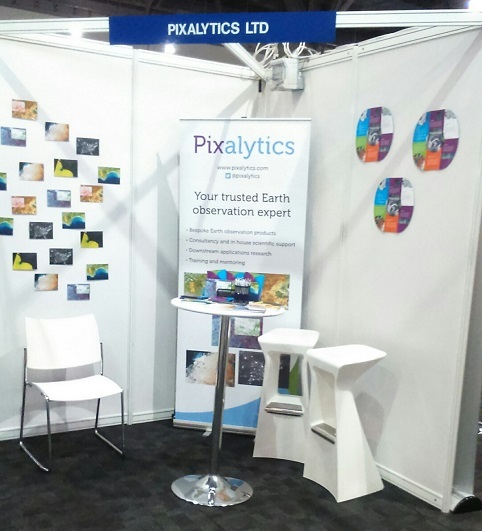 We’re at the UK Space Conference 2015 in Liverpool, and exhibiting! 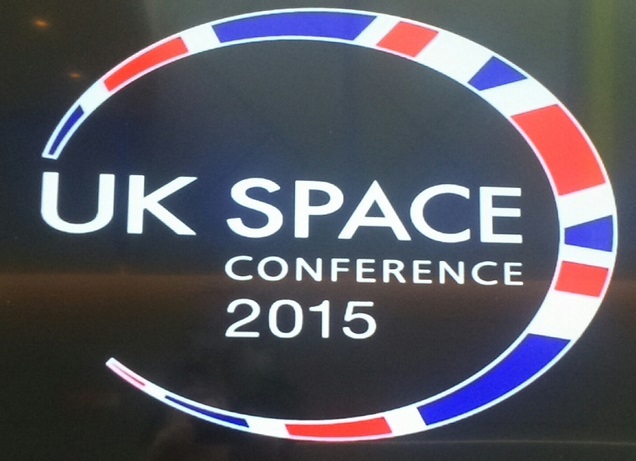 The opening day of the conference has been interesting, exciting and bookended by astronauts. The conference’s plenary session began with an upbeat assessment of the UK space industry, and the progress being made on the UK Space Growth Strategy of delivering a £40 bn sector by 2030; we’re currently at £11.8 bn. The plenary also had a presentation from Helen Sharman, Britain’s first astronaut; and the day ended with Tim Peake, Britain’s next astronaut, phoning into the conference from his preparations in Baikonur. The European Space Agency’s new Director General, Prof Johann-Dietrich Woerner, gave a very inspiring presentation that put space at the heart of society, politics, science and technology and highlighted the need for new ambitions, disruptive technologies and a village on the far side of the moon! Other interesting presentations included Aleksandra Mir & Alice Sharp who explored the collaborations between art and space. Stuart Armstrong from the fantastically named ‘Future of Humanity Institute’ explained how we could colonise the universe, using natural resources from the planet Mercury. Stuart Marsh, from the Nottingham Geospatial Institute, described using a greater range of persistent features (rather than just urban and rocky features as previously used) to provide more complete maps of ground movement from InSAR. A thought provoking session on the use of Earth Observation data within Climate Services took place on day two, particularly on the need to start developing information products, rather than simply providing data and images. The exhibition has also been positive. We’ve had good conversations with new people, reconnected with some old friends and given talks to groups of schoolchildren who attended as part of the conference’s Outreach / Education Programme. At our first exhibition earlier this year, we published ten top tips for first time exhibitors; now we’d like to add an eleventh – Make sure you know whether or not you have a stand? We are not kidding! We’d reserved exhibition space within the Small Business Hub, which included a cocktail table, two stools and space for one pull-up banner. The plan looked like we were all on one big stand with tables distributed throughout; however, when we turned up yesterday we had our own stand complete with walls! This was a surprise to us, and all the other Small Business Hub exhibitors. The surprise was followed by creative thinking, a shopping trip and then we Blue Peter’d our stand! You can judge the results in the picture on the right. The conference was great, and can’t wait until 2017! This entry was posted in Earth Observation, Education, ESA, Growth, Micro Business, Networking, Remote Sensing, Space Can Help, Space Industry, Supporting Activities, UK Space Industry, Understanding Space and tagged astronaut, Education, ESA, Exhibitions, InSAR, Invisible Dust, pixalytics, Tim Peake, UK Space Conference 2015, UK Space Industry, ukspace2015 by Andy. Bookmark the permalink.